I have to admit, I am not that handy in the kitchen. There are a few things that I'm really, really good at making and then the rest usually ends up a very mediocre mess. So, instead I put what talent I do have to good use by dressing up yummies cooked up by other people! Today is Day 2 of the Taylored Expressions Release Week, and we have a darling set and sentiment set to share that are just perfect for giving handmade and "homemade" gifts. From the Heart and From the Heart Funnies are for your friends and family who have a good sense of fun and who doesn't love a gift made from the heart? When we went apple picking a couple weekends ago, I picked up a jar of pear preserves made right at the orchard. I thought is would make the perfect gift and I was so excited to use these new stamps to create a pretty and fun card and gift set. Plus, do you see the cute tag on the jar of preserves? It's made with a coordinating die! So whether you are a whiz in the kitchen, or a champion knitter, or you just like to give gifts, it will be hard to resist dressing them up for the holidays! I hope you are getting into the gift-giving spirit! Tune in tomorrow for a little "pick-me-up" gift for all you coffee lovers. For more gift packaging ideas from the heart, be sure to check out the rest of the Baker's Dozen. 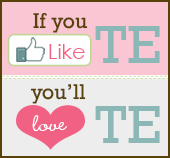 The sets and die I featured today will be available in the TE store on Thursday, November 4. Thanks for stopping by! 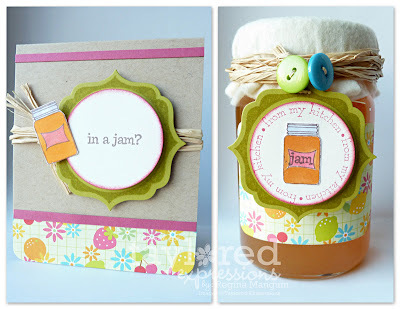 Oh I just love the colors on this one and that little jar is to die for! You're too cute! 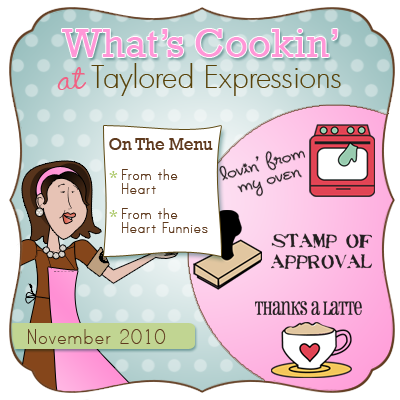 I'm sure you're not mediocre in the kitchen and I must admit I'd love to try one of your specialties someday! 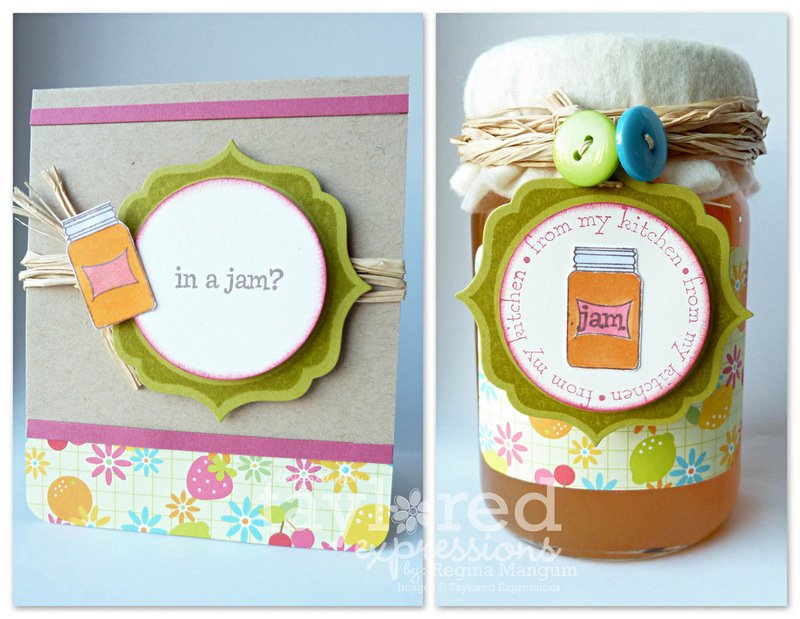 The pear preserves sound yummy and the packaging you created for them is oh so cute! OMG I love home made jam!!! 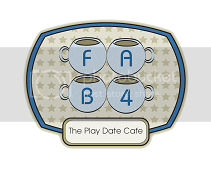 Your card and gift tag are adorable. This is such a neat idea! I need to start thinking about dressing up some cute holiday gifts like this! How absolutelty FUN Regina! LOVE how you dressed up the jam!! DELISH! Cute and fun gift set, Regina! I have to say I'm LOVIN' those From the Heart Funnies----adorable!!! This is so cheery and colourful!!!!! And I'm sure it's DELISH too!!! THis set is just adorable, Regina!